The first ever Hudson River derby provided no shocks as RNBY rather easily beat their neighbors, maintaining a control over the game even after going a man down. Marsch’s RBNY lined up in their customary 4-2-3-1 formation, where a narrow attacking midfield of Grella, Kljestan and Sam support Bradley Wright-Phillips up front. 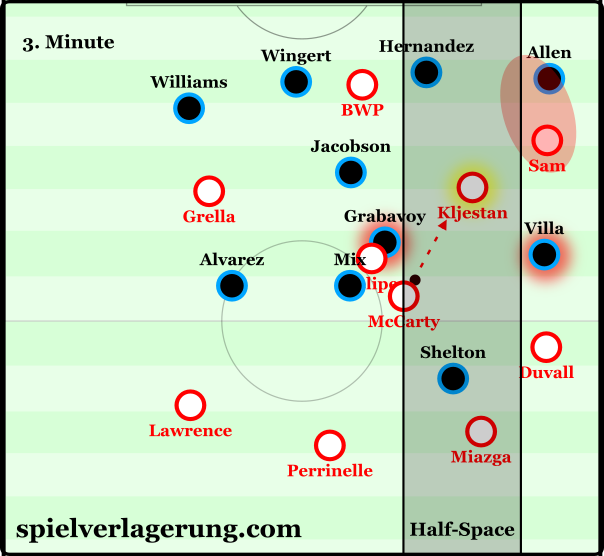 Felipe and Dax McCarty were the two central midfielders whilst the back four consisted of Lawrence, Perrinelle, Duvall and Miazga who was later sent off. The visitors featured in a 4-4-2 formation in which David Villa featured as a striker alongside Shelton. Goalkeeper Saunders was behind a defensive line of Allen, Wingert, Hernandez and Williams whilst Mix Diskerud was a key player in midfield alongside Alvarez, Jacobson and Grabavoy. After Lloyd Sam assisted BWP’s opening goal in the 4th minute from the right hand side, the home side had a fixation on this area of the pitch during their attacks. Lloyd Sam in particular thrived off of an evident qualitative superiority, where he could isolate Allen and exploit a dominance which developed from a very early stage in the game. From this he threatened frequently, whilst the supporting Duvall and ball-oriented movements of Kljestan were important, at times leading Sam to becoming a free player where he could then dribble directly inside. Through these supporting movements towards the right, overloads were possible which simply emphasized the superiority in ability yet this could have at least been counteracted somewhat by a better organised defence. Marsch’s team have a focus on their right flank in most games, considering the superiority which Sam has over most MLS defences. However this approach was particularly successful against their Hudson River rivals who defended the left side badly at times. Out of possession, Villa moved slightly to the left side in somewhat of a lopsided 4-5-1 shape yet positionally he created issues for his team and gave little true support for Allen. Due to a lack of ball-orientation in defence, overloads were easily created through the movements of Kljestan who supported both wings well. There were a number of issues for Kreis’ side without the ball, and perhaps primarily was their distinct lack of ball-orientation. They lacked any compaction near the ball which allowed New York Red Bulls to generate overloads in most areas of the pitch, primarily through the movements of the central midfield trio. Sitting in a mid-block, their lack of ball-orientation was a stark contrast to the much higher levels of the opposition and lead to easy developments down the right where RBNY created the previously mentioned overloads. Another contributing factor to this issue was their man-marking, as the wingers were always oriented on the RBNY full-back – meaning that the home side could effortlessly stretch and open up the midfield. A scene from early in the game – the man-marking of the wide players allowed the centre to become more accessible through the 2v1 on Jacobson’s side. Without any ball-orientation in the organisation of their shape, they lacked defensive access in numerous situations which could perhaps have been exploited better by the home side. This was often the case when McCarty or Felipe dropped slightly into the half-space to receive possession deep, where there was rarely an available player to press in time to be effective. Another issue was the lack of co-ordination between the players, which also had an impact on the poor defensive access. Whether this is a result of poor coaching, or the simple fact that NYCFC haven’t fielded a very consistent team for the opening of the MLS season, it caused them a number of issues against the ball. The home side emphasised this through creating central overloads with the inside movements of Grella and Sam, resulting in an even worse access for NYCFC. RBNY created the overload which restricted the opposition from pressing McCarty. Although the Spaniard worked relatively hard during RBNY’s third phase, he showed poor intelligence in positioning and simple teamwork during numerous situations. Sat slightly to the left against the ball, he often disrupted the balance of the organisation through indiscipline in his positioning and situational passivity. This particularly had an impact in the opening goal of the game, which came just 3 minutes in as Wright-Phillips easily finished a cross from Lloyd Sam. NYCFC’s lack of coordination for the first goal. A key feature of Marsch’s new system which he has implemented, has been their high block in defence. Although it wasn’t on display for too long considering Miazga’s departure in the 35th minute, it still impressed and showed in the home side’s dominant start to the game. The pressing of RBNY is highly focused around their narrow 4-2-3-1 shape which enforces a strong central control with the inside positioning of Sam and Grella who block any central developments well. 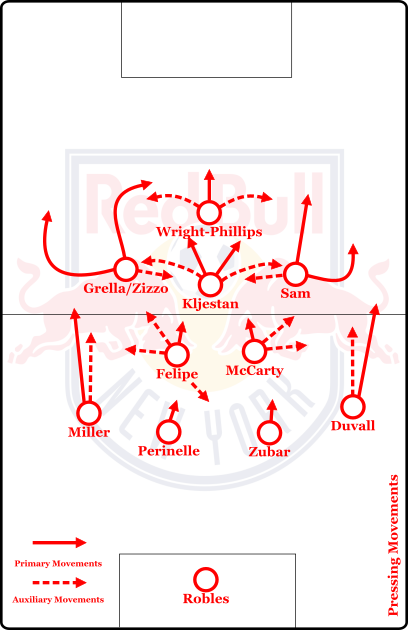 However, in the Hudson River derby Marsch seemingly made a slight change in shape to their usual pressing structure as they adopted more of a 4-1-1-3-1 in defence with Felipe higher than McCarty. The reasoning for this is somewhat unclear, although a possible explanation would be to press higher in midfield whilst maintaining stability against the central Villa. After the sending off of Miazga, Marsch made the standard change into a 4-4-1-1 with the substitution of Grella, moving Kljestan to left midfield. There were some slight changes in their pressing, which would unlikely have been sustainable with a man disadvantage. Mainly they became more reserved, changing to more of a mid-block with only intense pressure in the midfield. The compactness of RBNY was helpful in their organisation, as it was much superior to that of NYCFC and allowed them to maintain a decent control of the centre. The main reason as to why NYCFC failed to capitalise on the numerical superiority was caused by themselves. Even when possessing an extra player, the away side had no penetration and failed to utilise the centre at all. In the final third, there was no synergy across the attack which was often disconnected through a lack of an organised positional game. Aside from this, the wing-orientation meant for a generally poor attacking strategy, especially considering the centre had been weakened much more than the flanks following the red card. 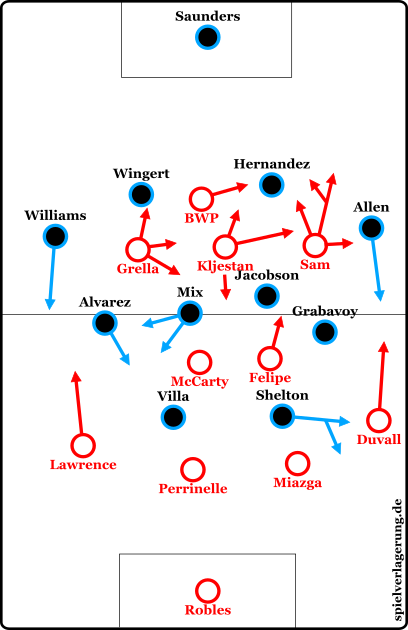 Marsch made some adaptions to his attacking strategy also, as they became more focused on transitional play to create chances, which resulted in the second goal of the game where Kljestan broke down the left and drilled a low cross for Wright-Phillips. It came as no shock to see RBNY win the first Hudson River derby, even following the dismissal of Miazga as NYCFC’s horrific streak continues. Although Marsch’s team weren’t at their best in relation to their pressing game and attack (though obviously the sending off has a large influence in that) they were still dominant and in control of the game throughout against a very poor NYCFC side. Kasper Vrolijk: Whats the name of the programm which you guys are using?